The death sentence delivered by a court to Christian woman Aasia Bibi Noreen in Pakistan is the definition of injustice. This is not about any religion. It is about justice, freedom of expression and freedom of religion. The Mullah in her village says he “cried tears of joy” when she was sentenced to death and “the whole village celebrated” (1). 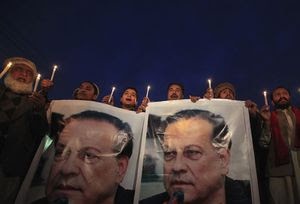 Even the Governor of Punjab province, Salmaan Taseer, who went to be photographed with her and called for the repeal of the blasphemy laws, was not safe. One of his own bodyguards assassinated him (2). Five hundred lawyers offered to represent the killer in court and he was showered with rose petals on his way to court. No lawyer has so far laid down his life to represent Taseer’s widow (3). Some of Taseer’s critics claim the assassination was linked to US drone strikes in Pakistan which have killed many civilians along with Taliban, strikes which US embassy cables show President Zardari of Pakistan approved, but the killing seems to have been directly related to Muslim clerics’ sermons on Aasia’s ‘blasphemy’, not to the drone strikes (5) – (7). Though the vast majority of people in Pakistan are Muslim, many are not extreme fundamentalists or bigots like those baying for Bibi’s blood and hero worshipping Taseer’s killer. Many want a secular state allowing freedom of speech and religion and fair trials. There are already petitions to ask the government of Pakistan to spare Bibi’s life. These might be enough to allow the government to delay the sentence until the fundamentalist mob find another imagined slight against Islam, or it might not be. Either way she might well end up dead at the hands of a fanatic, just as Taseer did. One hope might be to get the British or American or other governments to allow Bibi, her defenders and other victims of Pakistan’s unjust blasphemy law to become refugees in the UK. You can sign a petition to the British government asking them to offer refugee status to Bibi and these others here. If you live in the UK and you have time you can also email Home Secretary Theresa May MP at mayt@parliament.uk to ask her to grant Bibi and others asylum here – and/or email your own MP (you can find their contact details through this site).